ProdMod is coming to Maker Faire for the second time, this one being held in Austin, TX. Please come by and say hi if you are in the area. I will be located in the Maker Shed area displaying my LED Camera Light and LED Hoops. It’s a great opportunity to get up close and personal with the products, mount them to your camera, or swing them around your hips – you know which one is for which . If you were ever on the fence on whether you would like these kits or not, now you can judge first hand. I will also be unveiling a few new products not shown on my site and offering discounts on LED hoop upgrades for buyers at the Faire. I will also have a demo at 10:30 – 11:30am each day at the Make booth. I will try to walk you through some basic steps of assembling the LED hoop and show off some new camera lights. Here is a tease of what new stuff you’ll find at my demo and in the Maker Shed. 160 Lumen Camera Light with 3 position switch to reduce brightness level to 90 lumen. The actual LED is tiny so its hidden in a hole in the plastic housing. With no protruding lenses you can now add color correction gels over the opening to change the light output from cool to warm, or use a diffuse to soften harsh shadows. 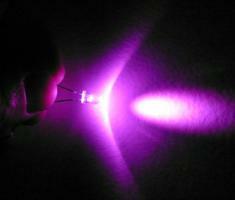 You can even use color gels to get red, blue, purple etc. Heat sinks keep the high current LED cool. Slim design slips into your pocket with ease. Mount it to your camera or tripod. Camera Power Base 5V USB - mount this to your camera or between your Camera and tripod as a power source for any USB powered device. Connect USB lamps with fully articulating goose necks to position your light exactly where you want it – top, side bottom, anywhere within arms reach. This device is perfect for macro photography. Make your own 5V USB lights and swap them out depending on what type of lighting you need- ring light, flood light, colored lights, etc. This Power Base uses 4 AA batteries to achieve 5V for standard USB so its a bit larger than the original Camera light. Added bonus: use this 5V source to charge any USB device such as your mobile phone, PDA etc. Modular Camera Light Base 3.6V 700mA- Powered by 3 AAA batteries this device can have any combination of output jacks such as 1/8 phono jack, or DC power jack, allowing you to connect a variety of lights and accessories to this power source. It attaches to your camera or between your camera and tripod. Make your own 3.6V light accessories and easily swap one for the other depending on your shooting style. This module is more compact than the 5V Power Base. It has the same small footprint as the original Camera Light and provides up to 700mA of current to power very bright lights. I am testing out a new flexible tubing. Its a little more transparent than the standard white tubing but it allows me to collapse the hoop easily into a figure 8 shape and fold the hoop in half for traveling. You don’t have to coil it down to a spiral like the standard kit. 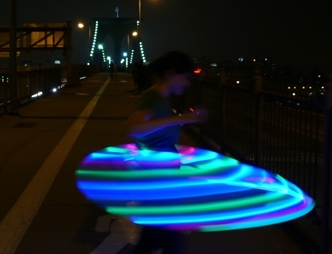 It will feel different hooping with it however since it is more flexible. So as in every design there is always a trade off. Come test out the new tubing at the Maker Fair and tell me what you think. If you buy an LED hoop kit at Maker Faire you will recieve a promotional discount on the new tubing to try it out. There will also be discounts for the rechargeable battery upgrade as well.